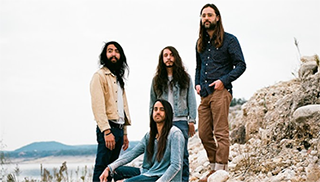 The Bright Light Social Hour convened while Curtis and Jack attended graduate school at the University of Texas in Austin. They released their self-titled debut in 2010 and scored six awards at SXSW 2011 Austin Music Awards. The Bright Light Social Hour contemplates a “Future South” on their second full-length album, Space Is Still the Place. The Austin artists—Curtis Roush, Jack O’Brien, Joseph Mirasole tackle a myriad of issues head on.